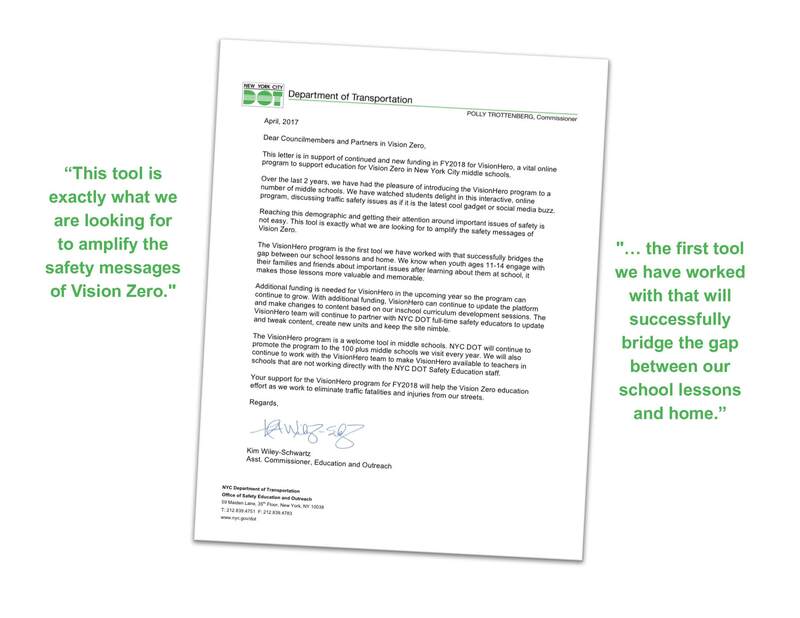 About VisionHero, Inc | VisionHero, Inc.
You’ve heard of Vision Zero, New York City’s awesome program that’s looking to reduce serious injury and death due to traffic crashes to zero by 2024. In the spirit of achieving Vision Zero in New York and many other cities, VisionHero, Inc is dedicated to help educate residents and policy makers about Vision Zero, street safety issues, and solutions. Tweens and teens are at high risk of being hurt or killed in traffic: for children between the ages of 4 and 14, being struck by a vehicle is the No. 1 cause of injury-related death. With these stats in mind, the founders of VisionHero, Inc (originally called StreetsAcademy) — Carol Crump and Peter Frishauf — set out to do something. Our goal is to reach young people in a meaningful, understandable way, that can change behavior to help young people stay safer. It’s free to use. And fun! 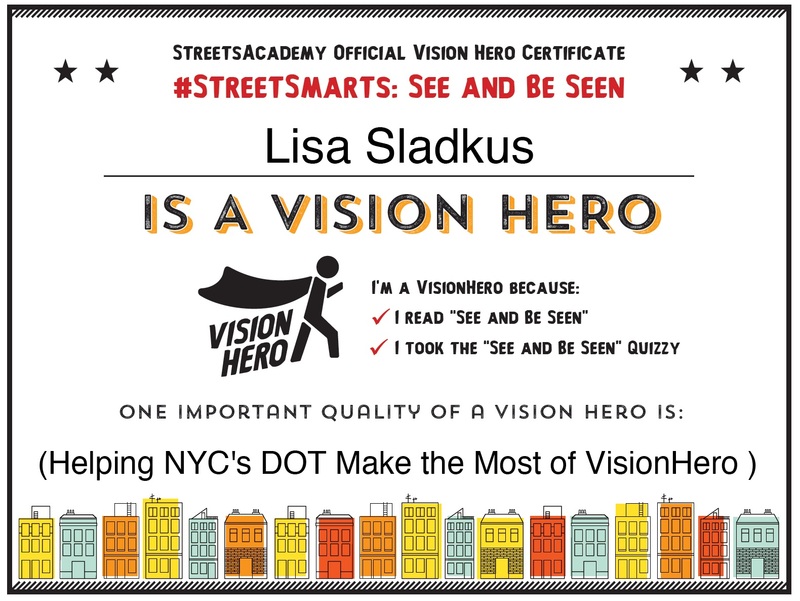 Using Stories and “Quizzes” VisionHero explains what to watch out for, and what to do as young people navigate city streets by themselves, or with friends, parents or guardians. On foot, bike — or riding in cars. 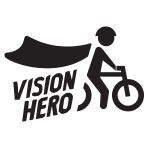 Like any good Superhero, VisionHero also sports a name that’s easily remembered and associated with Vision Zero education. Release 1.0 of VisionHero was launched in 2013, and Release 1.1 is available now and being used in middle schools throughout New York City by NYC’s Department of Transportation, Division of Education and Outreach. In classroom experience with DOT (and during other beta tests), students were highly engaged with VisionHero. Their recall on specific steps to increase safety while walking on streets, bicycling, or riding in cars, was high –- answering an average of 80% of quiz questions correctly. Moreover, middle schoolers enjoyed the youth-oriented content (animated Gif-pictures, videos, tweets, “quizzies,” and more). They were surprised by many of the data-points, and indicated they would share VisionHero with friends and families, in person, and on social media. When asked to grade us, most learners gave us an ‘A.’ The best features: being empowered to explore VisionHero at one’s own pace, with content that combines original writing with animated Gifs, tweets, videos, and interactive Quizzes. 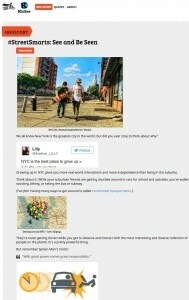 Can VisionHero match Teen interest in Instagram, Snapchat, or the Worlds of Minecraft? Probably not. But there is early evidence we can increase safety awareness significantly — and hopefully, change behavior. Back in 2014, Carol and Peter discussed the idea of an online VisionHero program with several New York City council members, who encouraged us to apply for modest “discretionary funding” to get it started. Simultaneously, we started conversations with DOT Assistant Commissioner Kim Wiley-Schwartz. Turns out Kim and her staff of some 30 educators were looking for a new program to reach the VisionHero audience. To qualify for city discretionary funding one first needs a “Fiscal Conduit,” a trusted nonprofit to handle any money you might get. VisionHero is proud that OpenPlans Inc agreed to be our conduit — pro bono. OpenPlans is the 501(c) nonprofit that supports StreetsBlog and StreetFilms, the pioneering journalism ventures that have changed the dialogue about streets safety worldwide. Next, we made the rounds, formerly presenting VisionHero to a number of city council members. Three members — Ben Kallos, Brad Lander, and Antonio Reynoso — loved the idea, and allocated a dollop of money. It was July, 2014 as we prepared to create the program with DOT over the 2014/2015 winter. The goal: introduce the program in schools in 2016. In 2016 New York City Council Member Ydanis Rodriguez, head of the City Council’s Transportation Committee, added his support to fund the VisionHero program. Much of the data and teachings in the VisionHero program is drawn from DOT curricula, and the city’s Vision Zero websites. Curating and re-presenting the information in an educational platform that will appeal to milenials requires an online platform to give our Hero lift. With the help of a VisionHero Braintrust,* and a group of smart 9 to 14-year olds, we researched and reviewed dozens of online text and gaming platforms that would be engaging, informative, and encourage our audience to take action. We also needed a platform that was easy to update based on user feedback and new information. In February, 2015, Carol found the perfect online platform and partner. And, like many great things, it’s local! Kicker was a Brooklyn-based news site with a big, young audience. Icing-on-the-cake: Kicker CEO Holly Epstein Ojalvo is a former high school teacher and parent to a young daughter. Together, VisionHero, Kicker, and DOT developed the content for VisionHero. Eight content sets — matched pairs of 4 “Stories” and 4 “Quizzies” were created, chock full of social and multi­media elements, links, and calls to action — original content, tweets, videos, and animated Gifs (moving images) on a single web page. Quizzy results can be shared on Facebook or Twitter; a certificate of completion can be printed. It’s fun and entertaining, while teaching what to watch out for, and what to do as we navigate our city streets by foot, bike — or riding in cars. 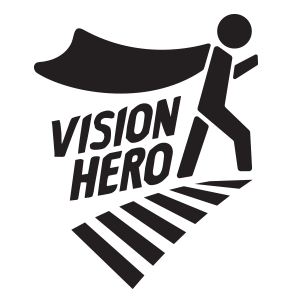 In September, 2016 Kicker passed the VisionHero baton to VisionHero, Inc.
VisionHero, Inc., now updates and maintains the site on its servers with the help of volunteers, consultants, and freelancers — and of course our partners in municipal government who are using the program. We’re delighted to have created 8 informative, fun, and immersive programs designed to help young people learn a central skill: how to stay safe while walking, bicycling, or riding i n cars in our cities. If research shows VisionHero to be effective in middle schools, we’re hoping to see it become an NYC citywide program in 2017, and adapt the program to other cities where VisionZero has been embraced. Use it today, and let us know what you think. To get to Vision Zero we need lots of Vision Heroes; to help, we want everyone to have access to the VisionHero content. That’s why the entire work is available under a Creative Commons Attribution Noncommercial-No Derivative Works 3.0 United States License. That’s a lawyerful mouthful! Lots of people helped make VisionHero fly. Co-Founder Carol Crump is President and Director of VisionHero, Inc,.and Co-Founder Peter Frishauf is Secretary and Director. Our VisionHero leadership team are volunteers Leah Wang and Vincent Keane (who both, with Peter Frishauf, launched Medscape in 1995), Cyrus Perovian, and Digital Artist Stephen Hopkins. Safe Streets advocate Lisa Sladkus, is VisionHero Inc Vice President and Director, and Christine Berthet of ChekPeds, a Director. Contacting Carol, Peter, Leah, Vin, or Cyrus by email is easy. Our email convention is our first name @visionheroinc.org. Check out VisionHero. Tell us how you like it. Follow us on Twitter: @Vision_Hero, on Instagram and Facebook. Tweet/follow Peter @pfrishauf and Carol @CLAIR0L. Email us at info@visionheroinc.org. 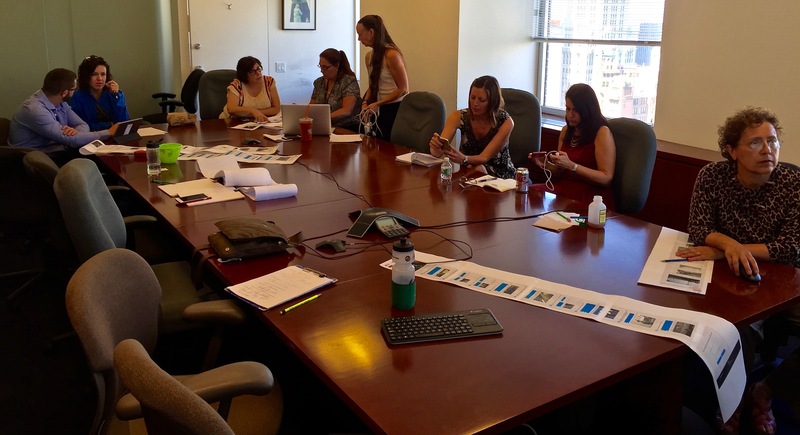 We’d also like to thank the many people at DOT’s fabulous Education and Outreach Division (Kim Wiley-Schwartz, Paula Gannon, Julia R Glauboch, Adam Marc Benditsky, and the recently-retired Ilona Lubman and Marjorie Marciano); Kicker’s Holly Epstein Ojalvo, Lisa Vehrenkamp, Elisa Lewis, Brianna Snyder, Olivia Prentzel, and Lily Altaven; OpenPlans’ Nancy Weber, Mark Gorton, and Ben Fried; StreetFilm’s Clarence Eckerson; tech wizards Ian Lynch Smith and Sebastian Delmont; Microsoft’s Grad Conn, and other friends of VisionHero, including Anand Gan, John McGarvey, John (Swift ‘n Safe) Read, Cyrus Peyrovian, and Sam Schwartz Engineering’s Sam Schwartz (@GridlockSam) and Erwin Alonzo. Logo and design guidance by the gifted Carly Clark. And thanks, too, to our group of 9 to 13 year old testers, who always teach us that our best guesses about what they might like can always be better.